Now back to normal and peace and quiet once again falls over the ranch again. My daughter wanted me show her how to make Scottish Tablet, something from my childhood and hers, she had tried but it never came out right. 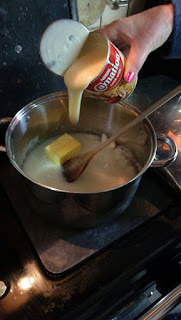 They had a box of it to take home with them, I will pop a link over on the recipe page made with butter, condensed milk and sugar its not one for those watching there weight. There is a few things going on this week, tomorrow Sol and me are making are special trip out will post about it later. Martin wasn't home this week end work commitments but he will be home on Wednesday night and bringing and teenage grandchild with him. You always have good things to share Dawn and I always look forward to them. I would love a good walk on a beach just now to get rid of some cobwebs. I am going to give that recipe a try. I have been trying to make it from my Mum's recipe but have failed miserably. Thanks for posting it. Looks like all the family had fun on their visit. Wow your recipe sounds like fudge, never tried it might have to make it. Sounds like you have had a lovely week with your houseful of family. They have certainly had fun. I will pass on the Scottish Tablet making as I need to get back to losing weight again. I loved the way you took the grandkids across the field with a torch, and then got them to turn it off! And they SURVIVED!!! Looks like good family time. All kids love a good box. We've still got one from christmas but it's getting smaller as the wife and I keep pinching bits off it to light the fire! Ha Kev, that made me laugh. We light the fires with anything, old shoes anything! Scottish tablet looks like fudge, is it? Very sweet I suspect.